(i) A lunch box, a compass box, a book, and a duster. (ii) A disc, a chalk box, a cubical cabin, and a tissue box. Draw a diagram to represent a cuboid. Label its vertices as P, Q, R, S, T, U, V and W. Now write the names of its faces and edges. Draw a diagram to represent a cube. Label its vertices as A, B, C, D, E, F, G and H. Now write the names of its faces and edges. A cube has 6 faces and 12 edges. ABCD, EFGH, BVGF, ADHE, ABFE and CDHG. AB, BC, CD, DA, EF, FG, GH, HE, BF, CG, AE and HD. Figure represents a cuboid. The lengths of the edges AE, EF and FG are indicated as l, b and h respectively. Indicated the lengths of all other edges. Following are the lateral faces for the base EFGH. AE or DH or BF or CG are the line segments representing the height of the cuboid. The four diagonals of the cuboid CE, BH, AG and DF. (iii) three edges which meet in the vertex G.
(i) The faces parallel to BFGC is AEHD. (ii) The faces adjacent to BFGC are BCDA, DCGH, ABFE, and EFGH. (i) A cuboid has ……………… vertices. (ii) A cuboid has ……………… edges. (iii) A cuboid has ……………… faces. 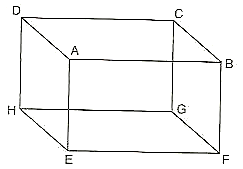 (vii)Each edge of a cuboid can be obtained as a line segment called in which two ……………… meet. (viii) ……………… edges of a cube (or cuboid) meet at each of its vertices. (ix) A ……………… is a cuboid in which all the six faces are squares. (x) The three concurrent edges of a cuboid meet at a point called the ……………… of the cuboid. (i) Number of faces in a cuboid and the number of faces in a cube are equal. (ii) A cube has twelve vertices. (i) What is the base of this cuboid? (ii) What are the lateral faces of this cuboid? (iii) Name one pair of opposite faces. How many pairs of opposite faces are there. Name them. (iv) Name all the faces of this cuboid which have X as a vertex. Also, name those which have VW as a side. (v) Name the edges of this cuboid which meet at the vertex P. Also name those faces which meet at this vertex. (i) UVWX is the base of a cuboid. (ii) The lateral faces for the base UVWX are UXSP, QVWR, PQVU and SXWR. (iii) Any one pair of opposite faces among the lateral faces of the base are PQVU and SXWR or UXSP and QVWR. There are two pairs of opposite faces among the lateral faces of the base of the cuboid. (iv) The faces, which have one of the vertex as X, are UVWX, UXSP and SXWR. The faces, which have VW as side, are QVWR and UVWX. (v) Edges which meet at P are UP, SP, and PQ. Faces which meet at vertex P are PQRS, UPSX, and PQVU. (i) Which edges are of length 4 cm? Which edges are of length 5 cm? (ii) Which faces have area equal to 20cm2? (iii) Which faces have the largest area? What is this largest area? (iv) Which faces have a diagonal equal to 5 cm? 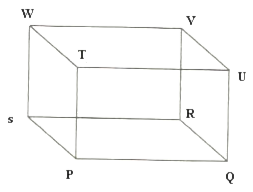 (v)What is the area of the base of this cuboid? (vi) Do all the lateral faces have the same area? (i) The edges of 4 cm length are AD, EH, BC, and FG. The edges of 5 cm length are AB, EF, CD and GH. (ii) The faces having dimensions of 5 cm x 4 cm would have an area of 20 cm2. And such faces are ABCD and EFGH. (iii) ABCD and EFGH have the largest area of 20 cm2. (There are three pairs of opposite faces of equal area. The area of opposite faces are: 3 × 4 cm2, 4 × 5 cm2, and 3 × 5 cm2. And among these, 4 × 5 cm2 is the largest. (iv) The faces having sides of 3 cm and 4 cm respectively would have the diagonal of 5 cm. (As hypotenuse of a right- angles triangle is: 32 + 42 = 52). Therefore, the faces ADHE and BCGF have the diagonal of 5 cm. (v) The base has q dimension of 4 cm × 5 cm, so area of abase is: 4 × 5 = 20 cm2. (vi) No, all lateral faces do not have the same area. The two lateral faces have an area of 3 × 5 = 15 cm2 and rest of the two lateral faces have an area of 3 × 4 = 12 cm2.